Saturday night was “Embrace Your Culture” night, celebrating the many different ethnicities and diversity of all the Golden Hawks players as both the women’s and men’s teams faced off against the Ryerson Rams. “I think there are many cultures that should be acknowledged and recognized. Living in kind of a white, mainstream society, it’s nice to highlight other ethnic diversities and cultures. 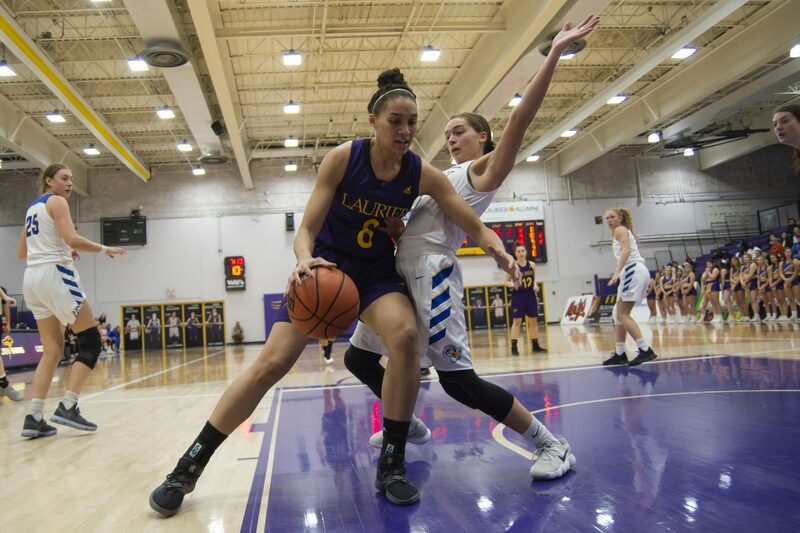 I definitely think that was a good idea and I think that a lot of people could feel extra prideful just for being acknowledged,” said Skye Johns of the Laurier women’s basketball team. After a hard-fought 67-65 win against the Toronto Varsity Blues, where the Golden Hawks managed to pull away in the fourth quarter, their biggest challenge followed in the number two Ryerson Rams. With Sofia Paska out, there was some work cut out but that Rams team isn’t just any team. The Rams came out firing, opening the game up on a 9-2 run in the first three minutes. From there, the Golden Hawks slowly came to find their footing, especially in the second quarter where they managed to pull themselves within six points, down 34-28 going into halftime. The third quarter is where this game got flipped on its head and became a showing out party for the Rams. They opened up with a 14-0 run and never looked back from there for the rest of the game. The Hawks never found any rhythm or their footing again and fell to the Rams by a final score of 79-54. “I think right out of the gate, maybe we weren’t great that first quarter defensively, but then we got into a bit of a rhythm, got more stops and were able to keep them under control on our glass,” coach Falco said. The second half of the double-header came with the men’s team playing against the number two Ryerson Rams. After thrashing the Toronto Varsity Blues by a score of 83-50 the night before and having given other top teams problems, this was expected to be a great game. The Ryerson Rams had other plans though. Missing their big man Tanor Ngom, they came out to prove how dominant they really are anyways, coming out with one of the most impressive performances seen this season. The Rams came out with a high level of intensity to go along with ridiculously strong defensive play. Their length and activity on the defensive end stifled the Golden Hawks from the tip. It also didn’t help when 6’8” guard Jean-Victor Mukama came out cooking to the tune of 13 first quarter points and finished with 27 points. The Rams were especially keyed in on stopping star Golden Hawks guard Ali Sow and with them getting so many stops on everyone else, they never allowed it be close. Not only that, they kept pushing their lead to the tune of a 97-52 win. “Their length is pretty impressive. Defensively, they’re just not giving you a lot of things to play with in terms of their ability to switch almost every single position,” coach Serresse said. Next up for the Golden Hawks will be the Queen’s Gaels and York Lions in back-to-back road games.